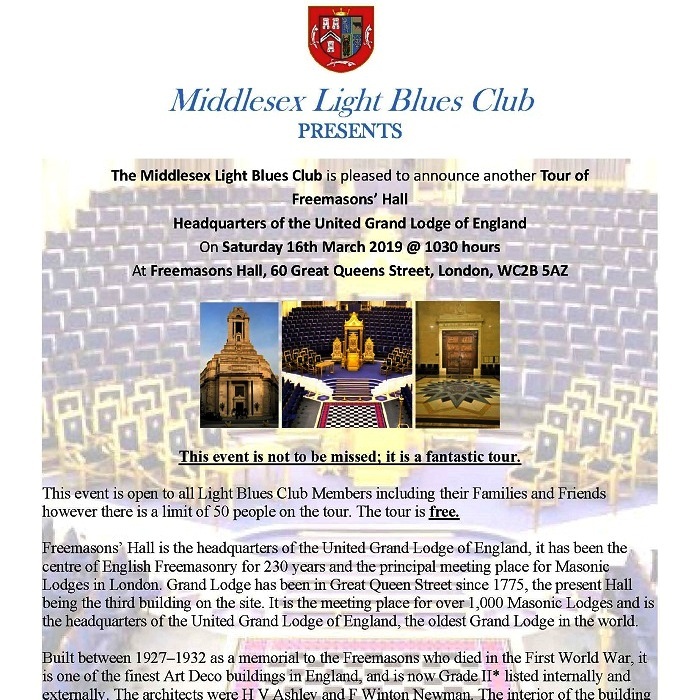 At Freemasons Hall, 60 Great Queens Street, London, WC2B 5AZThis event is not to be missed; it is a fantastic tour. This event is open to all Light Blues Club Members including their Families and Friends however there is a limit of 50 people on the tour. The tour is FREE. Freemasons’ Hall is the headquarters of the United Grand Lodge of England, it has been the centre of English Freemasonry for 230 years and the principal meeting place for Masonic Lodges in London. Grand Lodge has been in Great Queen Street since 1775, the present Hall being the third building on the site. It is the meeting place for over 1,000 Masonic Lodges and is the headquarters of the United Grand Lodge of England, the oldest Grand Lodge in the world. Built between 1927–1932 as a memorial to the Freemasons who died in the First World War, it is one of the finest Art Deco buildings in England, and is now Grade II* listed internally and externally. The architects were H V Ashley and F Winton Newman. The interior of the building is richly decorated. In addition to the Grand Temple (seating 1,700) there are 21 Lodge Rooms, the Library & Museum of Freemasonry, Board and Committee Rooms and administrative offices. For those Family and Friends that may have not have an interest in Freemasonry, or even the classic Art Deco design of the wonderful building that is Freemasons Hall, there is always the very nearby Covent Gardens, for those that would prefer a spot of shopping.